For the Mariners, pitching-wise, 2017 has already been a mixed bag. Drew Smyly showed some extra arm strength in the WBC, but then almost immediately afterward, he experienced arm discomfort that sent him to the disabled list. Yovani Gallardo has shown better stuff, but not better results. Hisashi Iwakuma has shown far worse stuff, and far worse results. Felix Hernandez, though, has gotten himself back to throwing consistent strikes. And then there’s James Paxton. Many have focused on whether Felix would be able to bounce back, but it’s Paxton who’s been the best and most exciting starter for a while. Last Saturday, against the Rangers, Paxton spun eight frames of shutout baseball, getting all the way up to 114 pitches. Some shutout efforts come as the result of exceptional defense or exceptional fortune, but Paxton threw strike after strike, whiffing nine of 26 opponents. He looked every bit like a rotation ace, and although it can take some time before that label is truly earned, Paxton is making a charge for it. In the early going, he’s made three starts. He’s allowed a run in none of them. I don’t mean to rip on any of those pitchers, and we might be seeing some breakouts in progress, I don’t know. But as long as that’s Paxton’s ERA-based company, it’ll be hard to say too much. Runs are what’s most important, of course, yet runs are also an unreliable metric to go on. You know how all of this works. As far as FanGraphs analysis goes, this is old hat. So the story for Paxton isn’t just how he’s opened the current year. It’s also about how he’s picked up where he left off. As 2016 sprinted to a close, Paxton was already pitching outrageously well. Players who end seasons well don’t always pick that up the next time around, but Paxton’s erased any and all doubts. This thing he’s doing — it’s for real, and it’s fantastic. For as long as James Paxton can keep himself healthy, he’s as watchable a pitcher as you’ll find. Let’s take things back to last July. In Paxton’s first start after the All-Star break, he struggled. He struck out one Astros hitter in five innings, allowing six runs. The next time out, Paxton dominated the Blue Jays. Through the Astros game, Paxton allowed 35 runs in 53.1 innings. Beginning with the Blue Jays effort, he was much sharper over his remaining 11 starts. He’s fifth in ERA, first in FIP, and second in xFIP. He’s second in wOBA allowed, and fourth in strikeouts minus walks. The only pitcher with a lower wOBA is Jon Lester. The only pitcher with a lower xFIP is Noah Syndergaard. 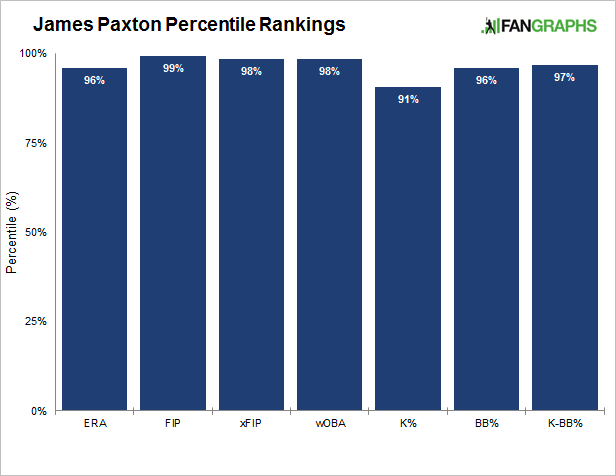 In these categories, Paxton is surrounded by aces, and that’s how one can understand what he’s becoming. You might not yet think of him as an ace, but his performance has been indistinguishable from the performances of the best starters around. On the off chance you’re unfamiliar with the story here, Paxton has always had an exciting arm. He was troubled by poor command and poor health. Down in Triple-A to open last season, Paxton lowered his arm slot, and everything else followed. He started throwing harder, and he started throwing strikes. His command has improved by several steps, and so his strike rates are routinely around 66 – 67%. Every single meaningful metric got better, and they’ve only gotten better still in 2017. This year, he’s started missing even more bats. He’s gotten better about controlling both sides of the plate. And as a key watchability point, Paxton has kept his between-pitches pace under 20 seconds. This season, he has the fourth-fastest pace for any starter. Strikes, whiffs, endurance, and tempo. Paxton is checking off all of the boxes. It’s great to have a swing-and-miss secondary pitch, because those can turn into mesmerizing GIFs, but the best pitchers can also use secondary pitches to steal strikes and get ahead. Paxton hasn’t always been able to throw his curveball in the zone. Even now, he does still miss, and he does still bury other curveballs in the dirt, but this curve is just perfectly located, and Andrus was never going to do anything with it. At 1-and-2, Paxton had options. Fastball? Curve? Cutter? Where? Another thing Paxton hasn’t always done is work comfortably with his heater upstairs. As someone who used to throw over the top, Paxton was always told to focus on keeping the ball down, as pitchers often are. Paxton now climbs the ladder more and more, and in this video, the pitch is spotted high and tight, above Andrus’ belt, to Paxton’s glove side. The result is a harmless pop-up, which is as good as a strikeout. Paxton wanted to keep three pitches down, and he did. He wanted to keep three pitches away, and he did. The one time he wanted to go up and in, he executed, also reaching back for an extra few miles per hour. The cutter stayed in Paxton’s back pocket. He didn’t need it, because when a pitcher can execute with powerful stuff, the whole game plan can be simple. There’s an interesting question to be asked about when James Paxton broke out. Is he breaking out now? Did he break out in last year’s second half? Did he break out the instant he started throwing harder, with a greater number of strikes? Yet the answer isn’t actually that important, because what matters is that a breakout has taken place. What I loved the very most about prime Cliff Lee was how he threw strike after strike almost without even thinking. Lee would throw a great pitch, get the ball, and almost immediately get to work throwing another great pitch. Paxton shouldn’t yet be considered on the Cliff Lee level, but the strikes and the tempo are there. Strikes, whiffs, and speed. With James Paxton these days, there isn’t any messing around, and hitters can be up against it before they know what’s happened. We hoped you liked reading James Paxton, the Everything-Doer by Jeff Sullivan! For some reason, until today I always thought James Paxton was right-handed. May as well be. I somehow doubt lefty-mashing RHBs are happy to see him on the hill. Considering how hard he throws, that would be an understandable assumption. And I always thought Walker was a lefty when he was in Seattle.